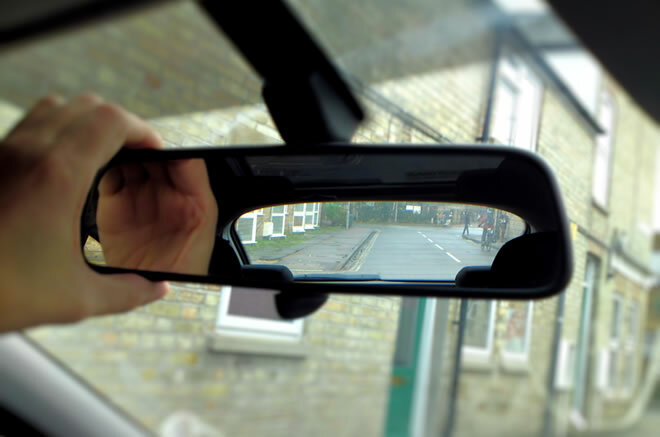 One of the top reasons for failing a practical driving test is the inappropriate use of mirrors, or a general lack of observation by use of the mirrors. There’s little point in using your car mirrors if they’re not set up correctly. You’ll need to set the mirrors so that you have the maximum view within the mirrors to the rear and side of the car. Advice on setting up your mirrors can be found in the mirror adjustment and setting the mirrors tutorial. Think of your car as being contained in a safety bubble. This bubble can only exist if you know what is going on around you at all times. Safety checks and correct use of mirrors creates this bubble. If you know where and what other road users and pedestrians are doing, you are able to constantly adjust your driving to keep the bubble intact. For example, if you see in your mirrors a motorist is driving dangerously close behind you, you can increase your following distance to the vehicle in front. This will increase your stopping distance allowing you to slow down sooner and to allow for the vehicle behind to stop in good time. Mirrors will allow you to locate cyclists and motorcycles is busy areas that often appear from nowhere. Blind spots in the mirrors often need to be checked, often at a similar time to the mirrors. Read the driving blind spot tutorial for further information. This tutorial will cover the correct use of mirrors of which will aid in you maintaining safe driving for life, but will of course provide essential skills enabling you to pass the driving test. Use car mirrors randomly whilst driving, though not to excess as the main priority is always the direction of travel. Random use of mirrors depends largly on what’s going on around you. For example a quiet, high speed ‘A’ road will require far less random mirror checks than a busy road with high traffic density, cyclists and pedestrians. This may or may not be relevant during your driving test as it depends where you park your vehicle Though if not applicable, it will apply after your test. Look into your right-side door mirror before opening your door to ensure there are no oncoming vehicles, cyclists or pedestrians that may be approaching. It is also worth checking the right-side blind spot to ensure that it’s clear. Remember for future reference, take your passengers into account. If carrying children, they often don’t check before opening doors. It’s equally important to act upon what you see in your mirrors before signalling. If for example you wish to turn right but a cyclist is preventing you from doing this, you may decide not to take that turn and proceed ahead. You will therefore not signal. Left and right turns – using the MSM or MSPSL routines set out above. Remembering a final glance into the left side mirror before committing to the turn to ensure motorcyclists or cyclists are not present. Changing lanes and overtaking – appropriate mirrors and blind spot must be checked before changing lanes. You’ll need to know what’s going on around you before a change of speed. Know how close a vehicle is behind you before slowing down. For example, if a vehicle is following closely and you slow down too quickly, it may not give them time to react. Or, if you intend on accelerating and another vehicle is attempting to overtake you, this could leave them in a vulnerable position due to oncoming traffic.